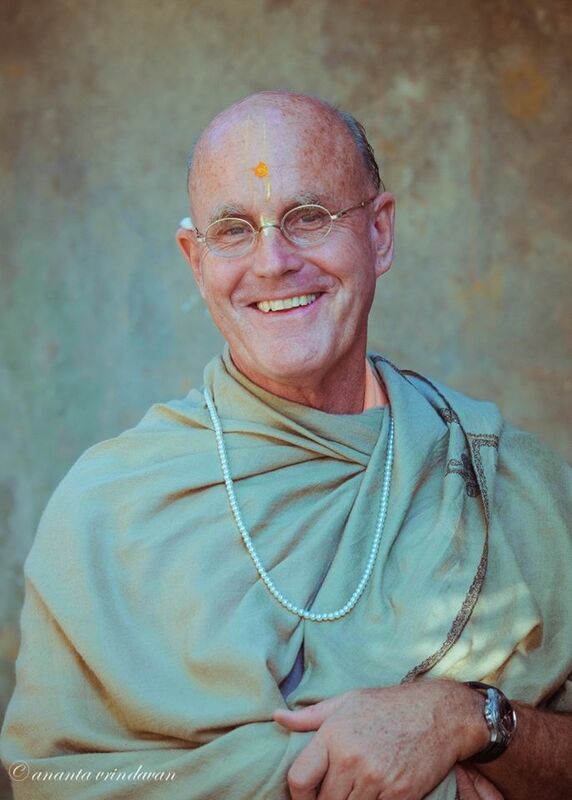 I left St. Petersburg this morning on my way to Vladikavkaz in southern Russia, traveling with His Holiness Bhakti Brnga Govinda Maharaja, Sri Prahlada dasa and three Russian disciples – Kartikeya dasa, my bodyguard; Uttamasloka dasa, my translator; and Madhavi devi dasi, our cook. Kartikeya dasa is a personal bodyguard of Russian President Boris Yeltsin and was given one month’s leave to travel with us. Along with fifteen hundred other devotees, we observed a four-day festival in St. Petersburg including Lord Nrsimha’s Appearance Day (when I initiated 104 new disciples) and my Vyasa-puja. The celebrations were incredible. The local gurukula staged three amazing theatrical performances, The Appearance of Lord Nrsimhadeva, The Pastimes of Lord Caitanya, and Brhad-bhagavatamrta. I especially wanted Govinda Maharaja to see Brhad-bhagavatamrta. The Russian gurukula children are talented young actors, and combined with their natural devotion the play brought tears to everyone’s eyes. The four days went by smoothly, the only hitch being that we didn’t take into consideration that it took three hours to serve prasadam to 15 hundred devotees each time. The southern Russian region we flew into is a safe haven in a war zone. Vladikavkaz is eighty kilometers south of Grozny, the capital of Chechnya, where Russian soldiers are still fiighting night battles with Chechnian guerrillas. Grozny has been devastated by the war, and refugees have taken shelter in outlying areas. Several hundred kilometers to the east of Vladikavkaz is an enclave in Azerbaijan called Karabach. Bitter fiighting between Azerbaijan and Armenia has been going on there for many years and continues today. Just 100 kilometers to the south of the city is Georgia, which has been made unstable by its recent war with Abkhazia. And six hundred kilometers to the southwest, Turkey has invaded a region of Iran in order to fiight Kurdish rebels there. As we approached Vladikavkaz Airport we saw the fiield lined with military helicopters complete with surface-to-air missiles and machine guns. After landing we saw Russian soldiers scurrying about everywhere. It appears that Vladikavkaz is one of the main bases for military action in Chechnya. But any fears or anxieties were immediately dissipated when we heard the kirtana of the local devotees waiting to greet us in the airport. At the head of the reception was Acaryanidhi Prabhu, the regional secretary and a disciple of His Holiness Prabhavisnu Maharaja. Any spiritual master would be proud to have such a disciple. He is a young man in his late twenties, and he organizes the preaching in this zone, a difficult area because of the warring factions as well as the nationalist spirit of the people. In such an atmosphere it is extremely difficult to establish a “foreign culture” like Krsna consciousness. I watched in awe last year at the Rostov Ratha-yatra as Acaryanidhi fearlessly stood up to the Cossacks and the local government and demanded they allow us to perform Ratha-yatra in the city streets. They refused, but we went ahead anyway and tried to stage the festival. The police attacked the devotees and confiiscated the Ratha cart. This year will be different, Acaryanidhi assured me. “They have to surrender and let us put on the festival,” he said. Although fearless in his approach as a preacher, he is a mild-mannered and humble devotee. Just seeing him inspires me in my service to Srila Prabhupada. He takes many risks for Krsna, but probably no one outside of this area knows him. He constantly travels and preaches, organizing the devotees and inspiring them in their services. He is a silent soldier whom I hope will one day be mentioned in ISKCON’s history books. Despite the difficulties surrounding the people of the Vladikavkaz region, Govinda Maharaja (who has been here before) told me they are extremely pious. Before the Russian Tsar conquered the area in the 1700’s it was known as the Kingdom of Ossetia, one of many small kingdoms in what is now southern Russia, including nearby Chechnya. But unlike the Chechnians who are tough and warlike by nature, the Ossetians are mild mannered and peaceful. Acaryanidhi told me the Russian politicians always try to marry Ossetian women because they are renowned for their chastity, dutiful nature, and pleasant disposition. They are also some of the most beautiful women in the Commonwealth of Independent States (CIS). We arrived in Vladikavkaz at 2:00 PM and immediately went to a program the devotees had arranged at a public hall. We were exhausted from the festivities in St. Petersburg (and for Sri Prahlada and me, six weeks of a successful but intense spring festival tour in Poland), but we quickly took prasadam and went on to the main street of Vladikavkaz for harinama to announce the program, due to start in fifteen minutes. minutes before it started. My question was answered as throngs of people came out from their apartments and shops following our harinama party. They appeared innocent and gentle and seemed to be enjoying the kirtana even though they had no idea who in the world we were. Soon many were clapping, then chanting and then dancing. It was an incredible scene: Sri Prahlada was enchanting them with his melodious and sweet accordion kirtana, and Govinda Maharaja was getting them to dance with his friendly and outgoing nature. But the people didn’t need much encouragement. They seemed to be naturally attracted. When we entered the hall everyone in the huge crowd quickly found their seats. I took a rough head count. More than six hundred people had come. I studied their faces. Though this is a predominantly Muslim region, the people are not fanatical, as in Iran, several hundred kilometers away. Rather, they are open and receptive. Also in the area are Christians, and surprisingly, demigod worshipers. The presentation was simple in comparison to the professional stage programs of our festivals in Poland. After fiive years of festivals there, we have put together a dynamic, fiive-and -a-half-hour program, which on our last spring tour included a bhajana with forty devotees, Bharat Natyam dancing, Indo-jazz dancing (contemporary dance to devotional music), a puppet show, lectures, pantomime, and a Hare Krsna rock concert. Now we were before six hundred people, and all we had on the agenda was kirtana and a lecture. prasadam. We could see how Lord Caitanya’s sankirtana attracts the masses. At 9:00 PM the owner of the hall turned the lights out, so we took the festival to the streets. Sri Prahlada led all the devotees and most of the guests through the streets with kirtana for another hour and a half.